I recently finished my first sola backpacking trip, a six day test-drive of the John Muir Trail. But until midway, when I jettisoned an excess five pounds of trail mix and dehydrated vegetarian protein, it was truly a hip-busting trial. In times of high altitude semi-delirium, I kept my feet in motion by humming Blue Oyster Cult's Don't Fear the Reaper and the theme song from the Flintstones. Over and over and over again. I plastered the welts under my waist belt with chunks of moleskin and did my best to look jaunty when I crossed paths with fellow hikers. And I swore not to remember just the phenomenal alpine scenery, but also the times when I wanted to shirk my pack and slink away. As a concept, pushing your boundaries sounds so inspirational and admirable, though so completely vague. Carting a food-overloaded backpack over 10,000-foot mountains? That's much more concrete. 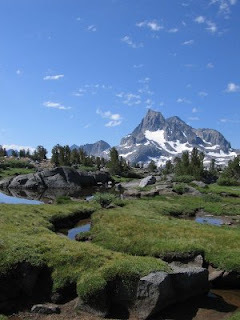 But it was so damn beautiful, with tubby marmots whistling at you on the trail, baby deer grazing in meadows and pure blue lakes reflecting snowy granite peaks. Yeah, I'll be back next summer. Pushing your boundaries is so much more satisfying when it's over.